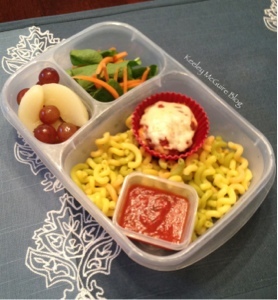 Little Miss called her lunch for tomorrow "fancy", lol. I just call it delicious! 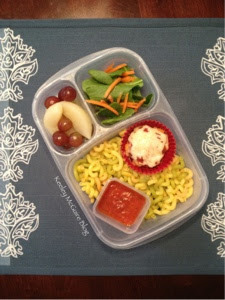 In her EasyLunchBoxes container, Little Miss has a Chicken Parmesan Cup in the main compartment along with Ancient Harvest Brand Quinoa Veggie Spiral Pasta. I included a small container of extra pasta sauce so she could pour it over the noodles. She also has a pear slice and grape fruit medley, along with a baby spinach side salad. Top 25 Foodies Moms of 2012!